Unfortunately, we weren’t able to do too much during Saturday morning’s scheduled work day on account of the stormy weather. The lumber was delivered and we had better than a dozen volunteers show up, but it just wouldn’t have been safe to work out in the middle of a thunderstorm. We decided to adjourn for the morning and regroup Sunday after services. But Saturday wasn’t a complete loss – the kids assembled a couple of nesting boxes, and a few determined souls went out in the drizzle after the storms had passed and pre-cut some lumber for Sunday’s build. On Sunday we enjoyed lunch after the late service and got to work. 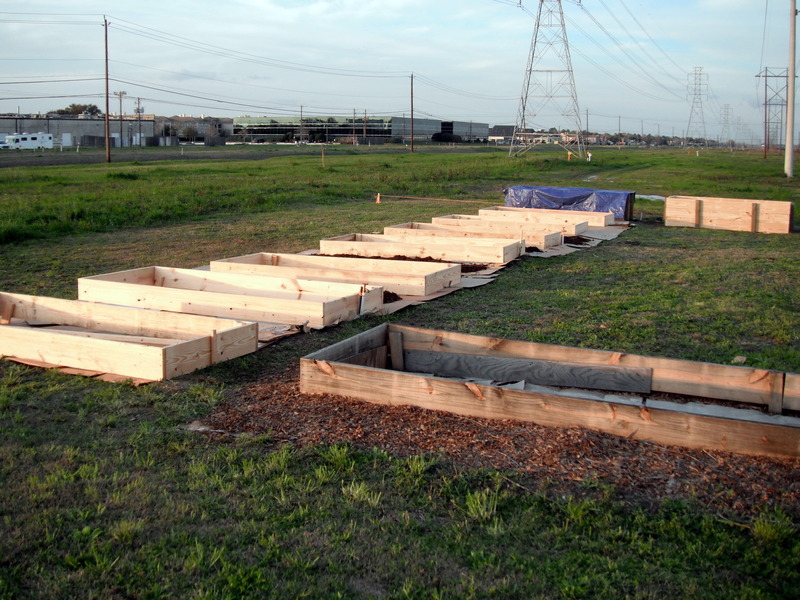 One crew worked on preparing the cardboard boxes to put down as mulch, another crew cut and assembled the raised beds and a third crew started working on the extra-deep beds. Inside, more seeds were started that will later be offered to gardeners for use in the beds. Some of the kids helped move cardboard around the garden and some helped assemble and hang more nesting boxes. We wrapped up around 5:00pm. We still need to construct, place and level the 4×20 beds. That might happen sometime this week or next using community-service volunteers. I’ll let everyone know when that gets scheduled. Our next scheduled workday is Saturday, March 3rd. We’ll have the soil delivered on that day – so between the soil and the mulch, there will be a lot of wheelbarrow work. Thank you everyone who showed up this weekend – especially those who decided to hang around after services to work in the garden without advanced notice! This weekend’s volunteers included: Mike Hibbetts, Jeff Boxell, Brad Stanley, Samuel Sanderson, Julie Lambert, Ruth Bastian, Madelyn Bastian, Bob Handy, Janet Ward, Maris Schmidt, Jane Malin, Paula Criswell, Cinnamin Rivers, Scott Rock, Jeannie Haman-Plummer, Alexander Montgomery, Patrick Gibbs, Bob Cooper, Rose Reis-Jackson, James Jackson, Dustin from Dickenson, Arthur Molin, Andrea Hoekstra-Molin, and David Overland. The kid crew included: Josie, Reulah, Ryan, Sara Jeanne, Clara and Lillian. If I’ve forgotten anyone (or if Dustin sees this and wants to tell me his last name), please let me know.